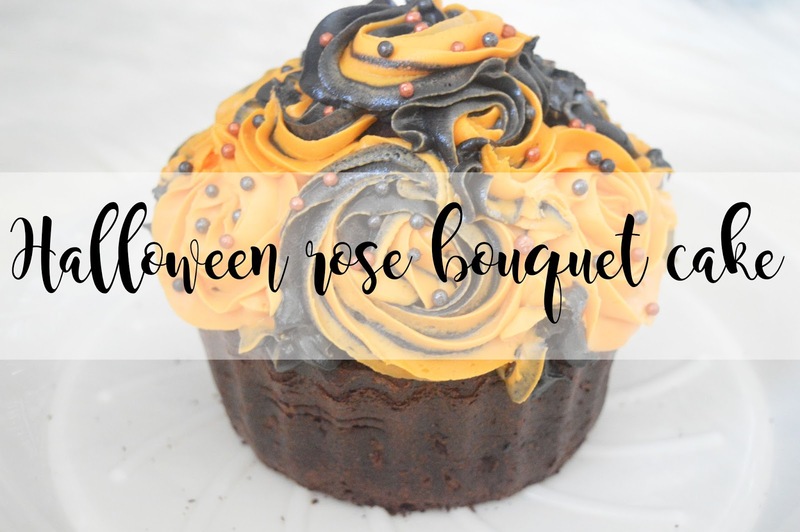 So far I have created a Halloween Layer Cake and Halloween Spider Web Muffins and I couldn't help but also create a Halloween Rose Bouquet Cake too! I think a Halloween bouquet of flowers would be absolutely stunning and I wanted to recreate this in a cake as I love the rose piping tip which Wilton have created! This is an easy cake to recreate, and you could even recreate it without purchasing the silicone giant cupcake mould if you haven't got one of these already! It would be the case of cutting the sides of a cake to create the rounded top. Easy! It's also yummy with a cup of coffee as an afternoon snack with a friend or family member! In a bowl, cream together the butter and sugar until it is light coloured and fluffy. Add the eggs one at a time and mix till combined. Then add the vanilla and mix again. Add the lemon juice to the milk and leave for five minutes until it goes lumpy. Sift together the cocoa powder and the plain flour into a seperate bowl. Add 1/3 of the dry ingredients to your large bowl and mix it all together. Then add half of your milk/lemon juice and mix again. Continue adding your dry ingredients and then your milk mixture until everything is incorporated. Pour the mixture into the giant cupcake base until 2/3 full. Pour the rest of the mixture into the top of the giant cupcake mould. Place into your oven for 60-70 minutes or until a skewer comes out clean. For the icing; use your favourite butter cream icing and colour using gel food colouring. Once the cake has cooled, cut off the tops so they are level and then spread your icing evenly onto the base of the giant cupcake and then place the top on. Using a Wilton 2D piping tip, pipe on your roses until you have covered the top of the giant cupcake. Add sugar balls of your choice, or any sprinkles you would like. I hope you like this Halloween bouquet style cake. This just looks so impressive! I'd feel so proud of myself if I could whip something like this up.